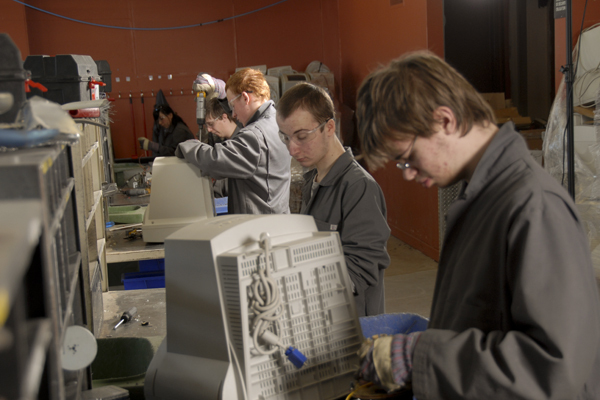 Nine CFERs work with electronic equipment in the province of Québec. Have you ever heard of schools called Centres de Formation en Entreprise et Récupération (CFER)? The program at these remarkable school companies has a significant impact on waste reduction, and we believe that it’s worth mentioning! There are 21 CFERs in Québec, the first of which was founded in Victoriaville in 1990. The program, designed for troubled youth, provides basic academic education and training in re-using and recycling various materials. In fact, because each school is a business, the business component is directly integrated into the program. While students learn about professional work habits, they also contribute to reducing the amount of waste sent to landfill. The types of materials recycled vary from one CFER to another, and include used work clothes, school furniture, electronics, and wooden pallets. Nine CFERs work with electronic equipment. The plastic and metal components are taken apart by students and sent to recycling centres. “At the CFER Normand-Maurice in Victoriaville, we receive between 55 and 80 tonnes of electronic equipment every year, and we recycle 99% of it,” explains Guy Martel, Director of the establishment. What a wonderful recycling accomplishment! Have you ever noticed one of these caravans travelling around the province? At times, students from the school venture out and give presentations to groups with the aim of raising awareness about sustainable development. These activities allow the students to share their knowledge and to develop self-confidence. Although most of the presentations are given to elementary and secondary school students, the caravan sometimes participates in public events. 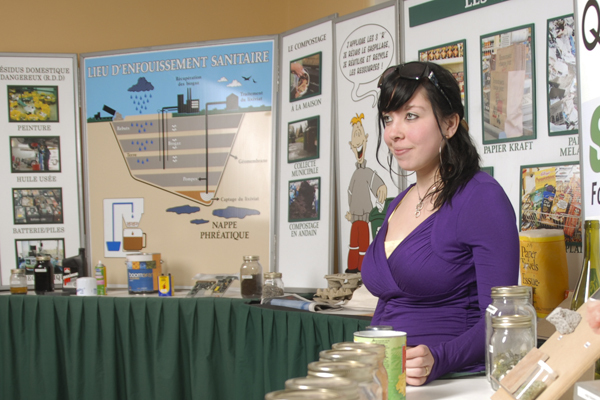 For example, this October 18 and 19, the sustainable development caravan from the CFER Normand-Maurice will be at La Grande Place des Bois-Francs, for the Journée Normand-Maurice. CFERs help improve access to the basic education that everyone needs. They help many young people to enter the job market, and they educate the public about various issues. With re-using and recycling as key components of its mission, it’s easy to see why the CFER network plays a significant role in sustainable development! Is there a CFER in your area? To find out more, visit the organization’s website.